This screen follows on directly after debtor input. 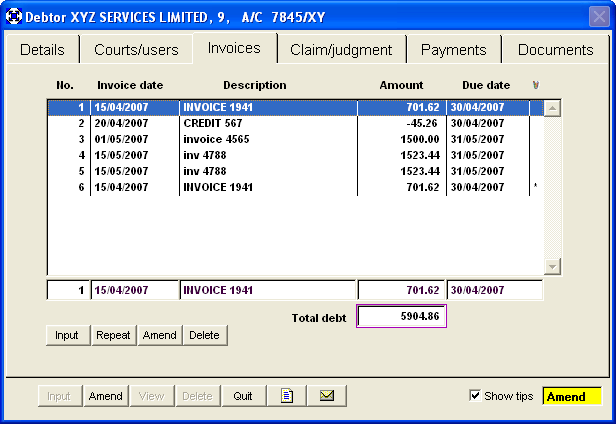 The debtor name and number is inserted automatically and you are permitted to insert 12 lines of debt detail. account basis all invoices in any given month fall due for payment on the same day. 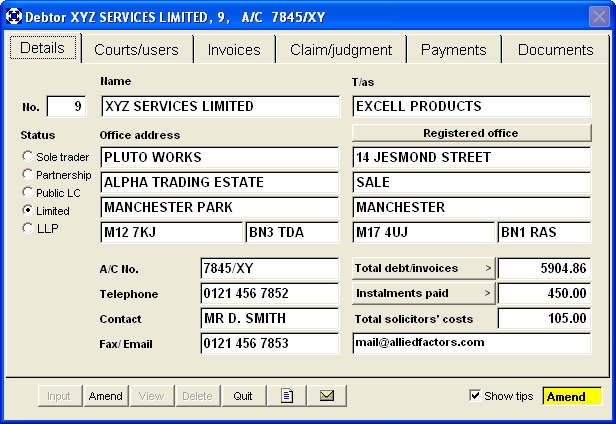 Invoice values should include VAT. The date of the payment is deemed to be its due date. 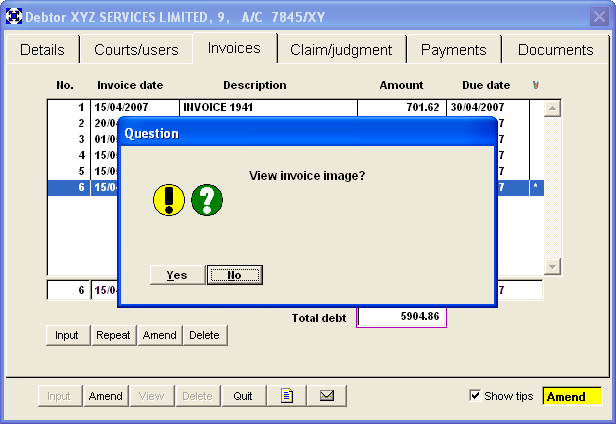 Invoices entered in ERROR may be deleted later which will reduce the total due on DEBTOR SCREEN 1. 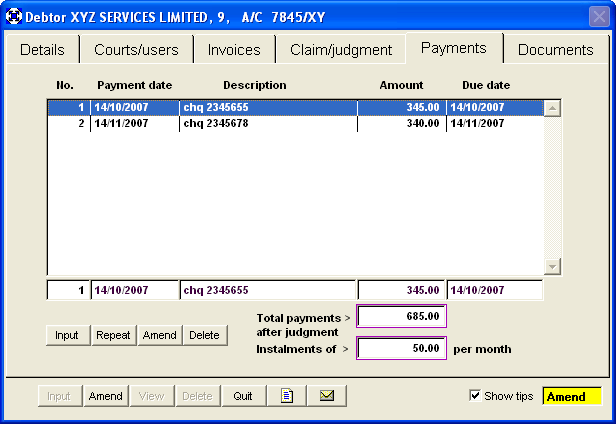 If, during the input process, you abort the first line of invoice detail, a default invoice line is stored with a reference '99999'. This may of course be superceded later with the correct invoices. You may delete any line from those displayed unless there is only ONE line. ONE line must remain as the breakdown of the debt due. Insert the normal address for correspondence. Insert telephone and fax number. figure, it will be updated. detailed record and notify the Court accordingly. This is the legal address for service of legal documents on a limited company or PLC. Insert notes in this scrollable window. 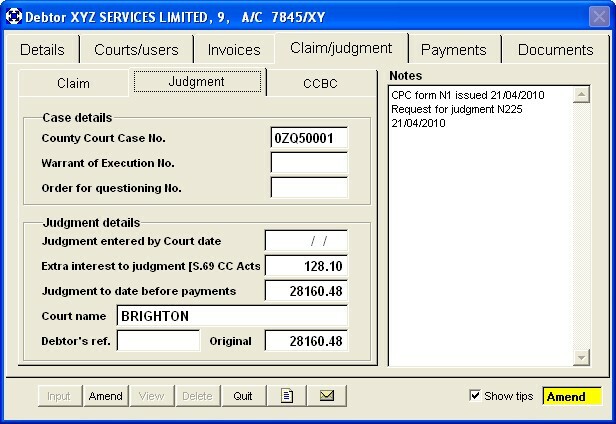 The system inserts events here Example: Claim issued 21/09/2006. 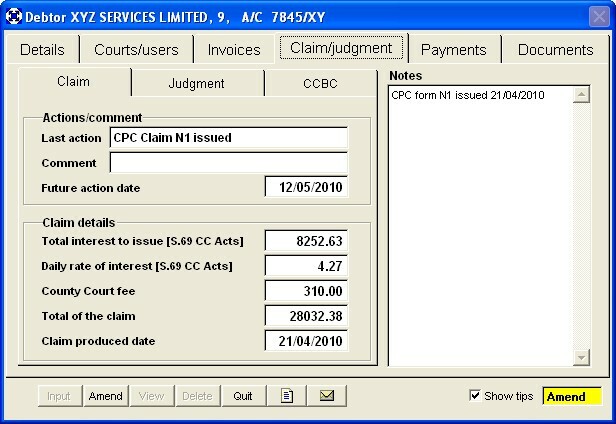 This page is used to record the user, debtor�s County Court and notes. 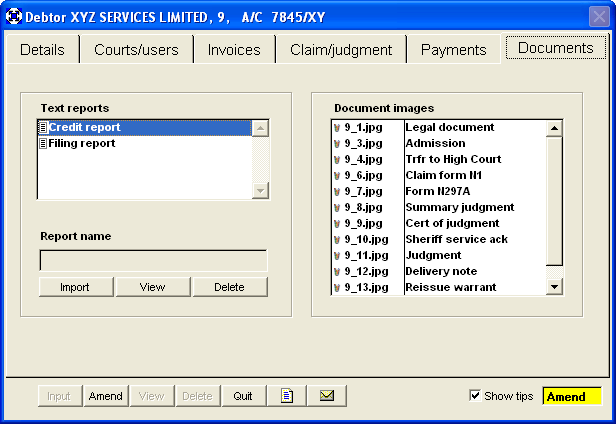 Fields are updated automatically as documents are issued, but can be amended if required. Refer to the simplified court flowchart. will be required to complete court documentation. Each additional Court fee is added to the judgment thereby increasing the amount owed by the defendant. You must notify the court of any payments received and deduct them to determine a revised judgment value. into "DEBT + INTEREST" on the face of the claim. The court claim fee on the face of the claim. The system calculates this for you automatically. The total of debt, interest and the claim issue fee. The date the claim was PRODUCED and the date appearing on the face of the claim. reference point for calculating 14 days to judgment by default. number of days x the daily rate. should include the cost of any previous attempt at enforcement. Insert any comments or notes as required. 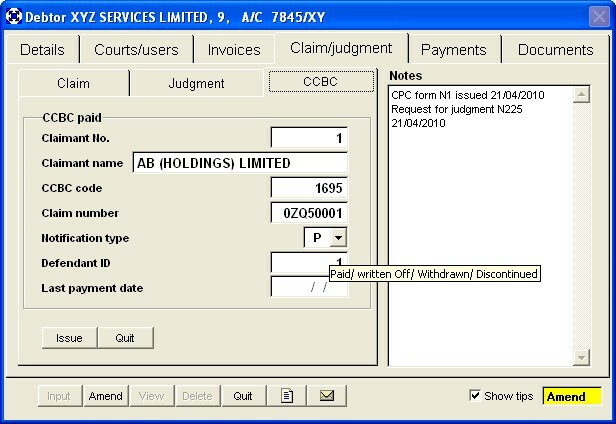 Insert notes in this scrollable window.The system inserts events here Example: Claim issued 21/09/2006. will place a comment whenever action is taken. The system automatically inserts a date 7 days ahead of each reminder letter. 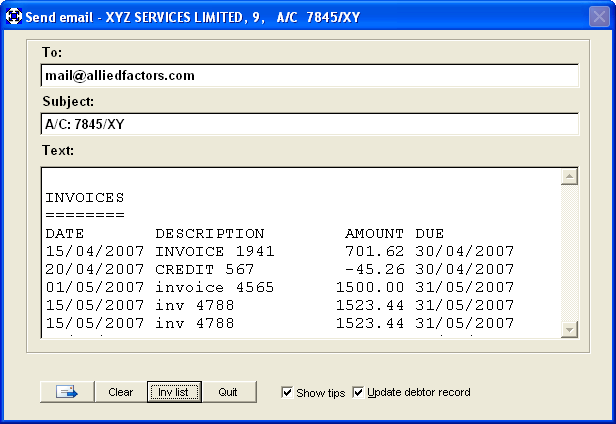 Use the DELETE option to remove debtor records no longer required. Eg. when payment has been made. has been transferred to the High Court for enforcement a reference like this will be given:  2006 -W- No.330. The Claim number will change if the case is transferred to another Court. Insert the Warrant of Execution number when you are notified by the Court. Insert the Oral Examination number when you are notified by the court. 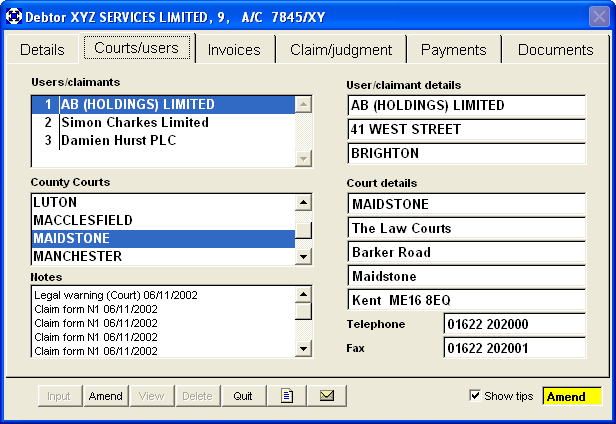 The system defaults to the user's County Court for proceedings. County Court. This can be used later in Legal and Letters.